Video: Did Russiagate Just Escalate Ukraine’s War? Prison Planet.com » Ukraine’s Future Nazi Leader? Video: Iran – Regime Change Agents Hijack Economic Protests? Like Ukraine, Syria, Libya? Video: Former CIA Analyst John Kiriakou On The Neocon Agenda For Ukraine & Syria. Video: Ukraine takes on Russia, calls to cancel veto power. Why? Who Owns Agricultural Land in Ukraine? Rogue states have no credibility whatever. Ukraine's regime is a US-installed Nazi-infested fascist police state. It's a serial lying machine. US-anointed illegitimate oligarch president Poroshenko ludicrously claimed Russia has 11,000 troops in Ukraine - during an interview on German ZDF television. "Today we can see that, despite the signed Minsk agreement, the number of Russian weapons and Russian troops on the occupied territory is increasing," he blustered. Not a shred of evidence supports him. He complained about continued conflict in Donbass. He ignored his military's full responsibility complicit with Washington, systematically breaching Minsk ceasefire terms. Putin spokesman Dmitry Peskov responded saying Russia "see(s) no need to repeat that such unfounded accusations without any specifics or any evidence, to put it mildly, do not contribute to anything positive here." Repeated accusations of "Russian aggression" in Ukraine are baseless - some of the most outlandish propaganda in modern times exceeding anything during Cold War years. A US-created state of war exists in Ukraine. On Thursday, NATO foreign ministers expressed their firm support for Kiev - ignoring its coup d'etat regime waging war on its own people. They continued turning a blind eye to Moscow's all-out efforts for peaceful conflict resolution. 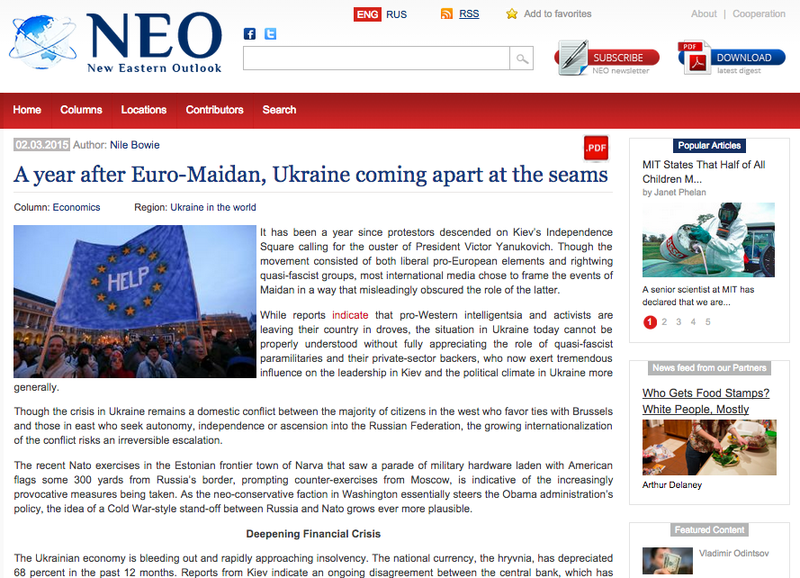 They outrageously demand Russia "cease its (nonexistent) destabilization of eastern Ukraine." US-installed NATO Secretary General Jens Stoltenberg regurgitates what Washington orders him to say. He ignored ongoing Kiev low-level aggression in Donbass, including against residential neighborhoods. He outrageous pointed fingers the wrong way claiming "an increase in ceasefire violations, primarily by the separatists, continued Russian support for them, and the continued obstruction of the work of OSCE monitor." False on all counts - willful Big Lies in support of Washington's imperial project to crush democracy in Donbass, harden fascist rule, and use Ukraine as a pretext to bash Russia irresponsibly risking direct confrontation. Stoltenberg expressed full NATO support for Kiev's Nazi-infested coup d'etat regime. "Our partnership is strong and getting stronger," he blustered. On May 14, Ukrainian state-controlled media reported fugitive former Georgian president Mikheil Saakashviki head of Poroshenko's so-called International Advisory Council for Reforms to solidify repressive fascist rule more than already. Saakashvili is a US neocon favorite. In Georgia, he's a wanted man. His assets were frozen by court order. He faces corruption and other criminal charges. An international warrant was issued for his arrest. An Interpol Red Notice was served against him. He'd been living comfortably in New York. In February, Poroshenko appointed him a non-staff advisor. Despite a Ukraine/Georgia extradition agreement, he’s granted safe haven status in Kiev. In August 2008, he was complicit with Washington in attacking South Ossetia. Russia was irresponsibly blamed for intervening to protect its own citizens - after hundreds were ruthlessly slaughtered. A 2010 Independent Fact Finding Mission Report ruled Saakashvili responsible for naked aggression. He's militantly anti-Russian. So is neocon US Senator John McCain. Poroshenko asked him to join Saakashvili and others on his so-called International Advisory Council - a cover initiative unrelated to responsible reform. McCain said he's unsure whether Senate rule permit his involvement. They favor all anti-Russian initiatives - the more outlandish the better. Stoltenberg said US-dominated NATO will send increasing numbers of so-called advisors to "strengthen Ukraine's ability to defend itself" - despite having no enemies except ones it invents. Low-level dirty war against Donbass continues - to be revved up to full-scale at Obama's discretion. Rogue states operate this way. Washington and Kiev partner in high crimes against peace. Ukraine is a US-installed Nazi-infested fascist police state - waging war on its own people. Criticizing regime policy is strictly forbidden. Anyone opposing state policies is targeted for elimination - by imprisonment or cold-blooded murder. Free and open media don't exist. Authorities want only their own views disseminated. Reporting hard truths on issues mattering most is criminalized. Journalists are murdered for doing their job responsibly. Western governments support what demands condemnation. Western media ignore what demands headlines. Kiev fascists operate extrajudicially. Poroshenko and supportive lunatics proposed "On legal regime of martial law" legislation. It mandates extrajudicial concentration camp internment and/or "forced relocation of the citizens of a foreign country who threaten or undertake aggression towards Ukraine." In January, Kiev's parliament declared Russia an "aggressor state." It called on UN authorities to disenfranchise Russia as a Member State. Some MPs wanted Poroshenko to declare war. The measure urged the world community to designate the democratic Donetsk and Lugansk People's Republics as "terrorist organizations." Russian Deputy Foreign Minister/State Secretary Grigory Karasin called Kiev's action "absolutely irresponsible…a thoughtless act designed to impede advancement to much needed compromise in Ukraine." Millions of Russian citizens residing in Ukraine are more at risk than any time since WW II. On May 12, Poroshenko's measure passed - police state terror by any standard, ignored by Western leaders and media. requires forced labor for all working-aged Ukrainians not currently performing military service. Martial law may follow at Poroshenko's discretion with parliamentary rubber-stamp approval. Ukraine increasingly resembles Nazi Germany. Perhaps its own version of Hitler's Nuremberg laws may follow. They institutionalized violence and solidified despotic rule. Enemies of the state included communists, Jews, trade unionists, social democrats, gypsies, homosexuals and anyone against Nazi governance. Aryans alone were entitled to citizenship. Others were designated state subjects with no rights whatever. Death camps followed. So did WW II. Does WW III loom? Nearly 7,000 civilians have lost their lives in the year-long war in eastern Ukraine between government troops and pro-Russian forces, Ukraine's president says. More than 1,000 people also remained unaccounted for and 1,657 Ukrainian troops died in combat, added Petro Poroshenko in an address before the parliament on Friday. President Poroshenko's figures mark a sharp upward revision compared to the latest estimate provided by the United Nation, which had suggested a tally of about 6,100 dead people. The peace deal remained the only solution in place for bringing back stability to eastern Ukraine, Poroshenko noted. In the latest development, however, Ukrainian military spokesperson Andriy Lysenko said on Friday that two servicemen had been killed and 26 others injured on Thursday. Ukraine’s warring sides reached a truce deal, though a shaky one, dubbed Minsk II, at a summit attended by the leaders of Russia, France, and Germany in the Belarusian capital city of Minsk on February 11 and 12. The agreement introduced measures such as a ceasefire, which commenced on February 15, the pullout of heavy weapons, and constitutional reform in Ukraine by the end of the year. The peace deal has dampened much of the fighting in Ukraine's volatile provinces but failed to halt regular violence at key hotspots. Donetsk and Luhansk, the two mainly Russian-speaking regions, have witnessed deadly clashes between pro-Moscow forces and the Ukrainian army since Kiev launched military operations in April 2014 to crush pro-Russians there. As Russia and leaders from dozens of other countries prepare to celebrate Victory in Europe on May 9 in Moscow, the defeated scourge again threatens regional peace and stability - courtesy of US-installed and supported Ukrainian Nazi thugs. They celebrated May 2 as Victory Day - the infamous year ago day when Kiev-unleashed Right Sector Nazi thugs murdered hundreds of anti-regime Odessans wanting to live free from the scourge of fascism. City police did nothing while they shot, bludgeoned, strangled, hacked to death with axes, and threw defenseless victims from windows of Odessa's Trade Union House building where they sought sanctuary in vain. Right Sector thugs awaited them inside for a well-planned mass murder operation ordered by Kiev, OK'd by Washington. "May 2, 2014 was a historic day for Odessa. Odessans bravely repulsed Kremlin gangs and their local leaders, thus protecting the city from the arrival of the 'Russian world.' "
"This day was decisive in the months-long stand off between the members of Odessa Maidan and the anti-government and staunchly pro-Moscow Anti-Maidan." "It culminated in Ukrainian victory and the beginning of a new page in the history of the city." Svoboda proclaimed May 2 as a "day of victory over the Kremlin terrorists groups, the day of purification from the Kremlin infection." "This day is a proud page in the history of the city." Washington is in bed with some of the world's most ruthless elements - including monarchal and other despots, Nazis, takfiri terrorists, and virtually any outlaw groups and individuals willing to do its dirty work. Last Thursday, State Department spokeswoman Marie Harf outrageously accused Moscow of "a lot of lip service…about its Minsk commitments but not a lot of action." Asked about the year ago Odessa massacre, she ducked explaining Kiev's responsibility complicit with Washington. She called the anniversary "important…not to lose sight of the bigger picture in Ukraine and that the fact that Russia's 'aggression' has left more than 6,000 people dead and displaced at least a million more." It bears repeating what previous articles stressed. Russia is the continent's leading peace and stability proponent. America threatens world peace. It bears full responsibility for Ukrainian crisis conditions - for dirty war without mercy against Donbass civilians, for last May's Odessa massacre murdering hundreds in cold blood. Don't expect any US official to explain. They're complicit in the highest of high crimes. Blaming Russia irresponsibly is cover for their own criminality - on an unprecedented worsening global scale. The Donetsk People's Republic Prime Minister Denis Pushilin accused Kiev's "overseas sponsors" (mainly Washington) of helping their puppet regime continue waging war on Donbass. Poroshenko refuses to observe Minsk ceasefire terms. He ignores them entirely. He's preparing for escalated war. "We are ready for any turn of events, but we will do the utmost to solve the situation at the negotiating table," Pushilin explained. Fascist regimes don't negotiate. They demand. Kiev and its US puppet master want unconditional Donbass surrender. They want nationwide fascist rule. They deplore democratic rights. They'll continue waging dirty war to eliminate them entirely nationwide. Expect lots more death and destruction ahead. Moscow expressed concern about blatant Kiev Minsk breaches - especially recent heavy shelling of Donetsk. Moscow's Foreign Ministry wants OSCE monitors to "demand that Kiev immediately stop a flagrant violation of the Minsk agreements." OSCE's Special Monitoring Mission (SMM) is expected to visit the targeted area on Sunday to assess what happened. Its latest report explained deteriorating conditions "involving live fire (by Ukrainian forces) near and at SMM patrols." Washington demands continued dirty war without mercy. Expect escalation at Obama's discretion. What millions died for to defeat during WW II is now resurgent in Europe's heartland. Fascist lunatics in Washington installed overt Nazis to run their newest client state. They're taking full advantage. They're waging naked aggression on Donbass - at present low-level ahead of renewing it full-blown. Hundreds of US combat troops (trained killers) are working directly with Kiev's Nazi-infested National Guard and other extremist groups - teaching them the fine art of murder. Perhaps planning to join them in battle when hostilities resume full-blown - maybe with supportive US terror-bombing. Kiev Nazis want all opposition elements eliminated - either killed, imprisoned, disappeared or deported. They want unchallenged control. The Saker reports they created a database of "separatists (and) militants, etc." It's called "(i)information for law enforcement authorities and special services about pro-Russian terrorists, separatists, mercenaries, war criminals, and murderers." Anyone opposing fascist rule risks being eliminated one way or another. Nazis under Hitler were notorious for radicalized torchlight parades - complete with chilling slogans and symbols. In January, thousands of Ukrainian ultranationalists paraded in Kiev. They celebrated Nazi collabortor/mass murderer Stepan Bandera's 106th birthday. At the time, Czech President Milos Zeman was horrified. "There is something wrong with Ukraine," he said. "Yesterday evening I was browsing the Internet and discovered a video showing the demonstration on Kiev's Maidan on January 1." "These demonstrators carried portraits of Stepan Bandera, which reminded me of Reinhard Heydrich" - Gestapo head and key holocaust architect. "The parade itself was organized similar to Nazi torchlight parades, where participants shouted the slogan: ‘Death to the Poles, Jews and communists without mercy,' " Zeman explained. Ukrainian fascists consider Bandera a national hero. He was a vicious mass murderer. Russia's Foreign Ministry Commissioner for Human Rights Konstantin Dolgov calls reemergent Nazism in Ukraine a European threat. "Torchlit marches in Ukraine demonstrate that it is continuing to move along the path of the Nazis," he stressed - with full US support and encouragement. They were at it again in Odessa. They marched to commemorate Maxim Chaika's death - ultranationalist Blood and Honor group leader. He died during a 2009 street fight. Around 200 overt Nazis were involved - marching while shouting racist/anti-communist/anti-Russian/ultranationalist slogans. "The White man is for the Great Ukraine," they chanted. "One race, one nation, one homeland." "Glory to Ukraine - the glory of heroes!" "Hang the commies." Odessan police accompanied marchers to protect them. Participants evoked memories of May 2, 2014 when Right Sector Nazi thugs murdered hundreds of Odessans in cold blood. They remain unaccountable for appalling high crimes. So-called investigation into what happened whitewashed them. State-sponsored mass murder in Ukraine is considered OK. Anyone wanting democratic freedoms is vulnerable. Truth-telling journalists risk imprisonment or death. Nazi-infested fascist regimes tolerate no opposition. Last week, Normandy Four foreign ministers called for ending fighting in Donbass. Washington bears full responsibility. Its Ukrainian proxies share it. Germany and France have done nothing to halt it. Russia alone continues going all-out to end it - impossible given Obama's rage for war. Last Thursday, Defense Minister Sergey Shoigu said "(t)he United States and its allies have crossed all possible lines in their drive to bring Kiev into their orbit." "That could not have failed to trigger our reaction. Aiming at complete dominance, Washington stopped taking into account the interests of other countries and respect for international law." On April 16, addressing Moscow's fourth International Security Conference, Foreign Minister Sergey Lavrov said it's "impossible to resolve the conflict in Ukraine by military force." "(T)here is no reasonable alternative to peacefully settling the domestic Ukrainian crisis (than) on the basis of full and unconditional compliance with" February 12 agreed on ceasefire terms. He hopes Western officials will "force authorities in Kiev to scrap destructive policies aimed at glorifying the Nazis and persecuting those who saved Europe from" its scourge. As long as fascist neocons run things in Washington, chances for world peace are nil. Expect endless wars to continue - perhaps with nuclear weapons able to end life on earth. Obama's fascist Ukrainian friends are ruthless. They're dangerous/unscrupulous gangster thugs systematically abolishing personal freedoms. Try finding a single major Western media report explaining Kiev regime lawlessness - and the ominous threat it poses. None exist. What demands denunciation gets scoundrel media support. On the one hand, Ukrainian officials are actively readying for renewed full-scale aggression on Donbass - with full US support and encouragement, including heavy weapons and munitions supplied. On the other, they're reigning terror on anyone opposing their ruthless rule - courageous individuals demanding democratic rights. Obama and Kiev officials partner in high crimes. One rogue state supports another. Both countries are fascist police states - with laws abolishing personal freedoms. Last May, Right Sector thugs massacred hundreds of Odessans in cold blood unaccountably. They're at it again. Residents rallying against dire economic conditions, force-fed austerity, unaffordable gas prices, and lost freedoms were harassed, threatened, kidnapped, and taken to an unknown location. One protester spoke for others saying "(w)e came here to a peaceful rally in support of initiatives to strengthen local self-government, including initiating 'Porto-Franco' " free trade zone status. Odessan taxes go to Kiev. Local socio-economic needs are largely ignored. "We wanted to tell (Ukranian) officials that we will not allow lawlessness and require them to fulfill their duty before the people," another protester said. Fascist thugs challenged peaceful demonstrators - kidnapping over 50. Their whereabouts remains unknown. Based on notorious Kiev practices, they're likely being brutalized in confinement. Perhaps some were killed. The Ukrainian web site Khvylya controlled by state authorities openly calls for imprisoning or deporting pro-Russian supporters. It separately urged killing Russian journalists in Donbass. Nazi-infested fascist regimes operate this way. Illegitimate Ukrainian governance is a cancer in Europe's heartland - fully supported by Washington, rogue EU partners, and go-along media scoundrels ignoring Kiev's worst crimes. They include assassinating political opponents. In recent weeks, seven high-profile "suicides" were reported - state-sponsored murder by any standard. Zaporozhzhye regional governor/former ruling Party of Regions member Alexander Peklushenko was the most recent victim last month. "Alexander Peklushenko committed suicide at his home in the village of Solnechnoye. At the moment the investigative team is working on the scene." Fact: Cold-blooded state-sponsored murder in Ukraine is called "suicide" to conceal criminality. Another former ruling Party of Regions/State Property Fund head, Mikhail Chechetov, was reported dead after mysteriously falling from his apartment window - on the same day as Boris Nemtsov's murder. Political assassinations reflect official Kiev policy. Thousands of others are lawlessly imprisoned under horrific gulag conditions. Unknown numbers perish during confinement. Some just disappear. On Thursday, prominent anti-regime journalist Oles Buzina was murdered in Kiev - the latest political assassination. He supported legitimate/ousted Ukrainian President Viktor Yanukovych. He was shot to death near his apartment building in central Kiev. Witnesses said two men wearing masks fled the scene in a Ford Focus car with either Latvian or Belarusian license plates. Buzina was a journalist/writer/TV host/known Poroshenko regime critic. On April 13, journalist Sergei Sukhobok was murdered. He co-founded the online sites Obkom and ProUA - critical of fascist rule. "It is scary because none of the leaders in the EU will take notice that, day after day politicians are being killed in Ukraine." "Let’s try and find at least 20 tweets of foreign ministers of Estonia, Lithuania, Latvia, Poland, Sweden, the UK, Canada, USA, and Australia, representatives of the OSCE, EU and NATO expressing concern over the killing of Ukrainian politician and condemning the situation in Ukraine." On Wednesday, former MP/regime critic Oleh kalashnikov was murdered in Kiev. He was found shot to death near his residence. Konstantin Kosachev heads the Commonwealth of Independent States Federal Agency. He urged Western leaders to "pay attention to the political killings in Ukraine instead of the rhetoric of sanctions against Russia." Former Ukrainian Prime Minister Mykola Azarov blamed Kiev for political murders. He denounced Western leaders, saying "because of your support in Ukraine there are political murders, terror taking place against political opponents, and all the people." "What else should these Nazis do, for you to finally understand and be aware of your responsibility for what is happening now in Ukraine." It bears repeating. US-installed/Nazi-infested Kiev thugs threaten their own people and European peace. It's more fragile today than at any time since events preceding WW II. It has been a year since protestors descended on Kiev’s Independence Square calling for the ouster of President Victor Yanukovich. Though the movement consisted of both liberal pro-European elements and rightwing quasi-fascist groups, most international media chose to frame the events of Maidan in a way that misleadingly obscured the role of the latter. While reports indicate that pro-Western intelligentsia and activists are leaving their country in droves, the situation in Ukraine today cannot be properly understood without fully appreciating the role of quasi-fascist paramilitaries and their private-sector backers, who now exert tremendous influence on the leadership in Kiev and the political climate in Ukraine more generally. Though the crisis in Ukraine remains a domestic conflict between the majority of citizens in the west who favor ties with Brussels and those in east who seek autonomy, independence or ascension into the Russian Federation, the growing internationalization of the conflict risks an irreversible escalation. The recent Nato exercises in the Estonian frontier town of Narva that saw a parade of military hardware laden with American flags some 300 yards from Russia’s border, prompting counter-exercises from Moscow, is indicative of the increasingly provocative measures being taken. As the neo-conservative faction in Washington essentially steers the Obama administration’s policy, the idea of a Cold War-style stand-off between Russia and Nato grows ever more plausible. Nile Bowie is a columnist with Russia Today, and a research affiliate with the International Movement for a Just World (JUST), an NGO based in Kuala Lumpur, Malaysia. He can be reached at nilebowie@gmail.com. What weapons does USA ship to Europe for war in Ukraine? Kiev Regime Confirms that Russian Invasion of Ukraine is a Hoax!